[THE INVESTOR] Korea’s second-largest network operator KT unveiled a range of new ICT-based solutions and technologies Tuesday geared at improving maritime security. The telecom firm’s standout technologies include a Long-Term Evolution network able to cover remote locations, as far as 200 kilometers away from land, a life jacket that can be tracked via Internet of Things technology and the creation of a new network designed for IoT devices. The company decided to develop the solutions to protect people from accidents at sea, as Korea has been subject to a growing number of maritime accidents for the past few years, according to Oh Sung-mok, vice president of KT’s network division. “Last year, Korea, a country surrounded by sea on three sides, saw around 900 maritime accidents during which some 2,000 people died,“ Oh said during a ceremony held Tuesday in Seoul to introduce KT’s new technologies. “In light of the growing importance of maritime safety, KT has developed a number of ICT solutions to protect people from such accidents at sea,” he said. KT’s most notable technology is its patented LTE Time Advance network, which depends on a set of horizontally distributed antennas to quadruple the network coverage distance from a given base station to a mobile device to 200 kilometers, compared to 50 kilometers for conventional LTE networks. The new network technology grants those far from land, such as ocean research stations, access to fast and stable internet via KT’s LTE network, the firm said. “We believe 200km is the farthest network coverage ever reached by a telecom company. We plan to export this technology in the future as it may be useful in other countries,” Oh told reporters. 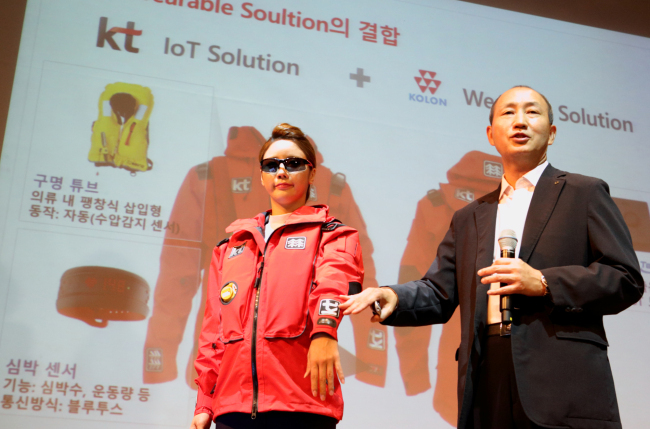 The Korean network operator has also teamed up with materials and fashion firm Kolon Industries to develop an IoT-based life jacket that can help track down people and aid rescue missions in the case of maritime accidents. When a jacket wearer falls into the water, a water pressure sensor detects the change and inflates a rescue tube. The IoT module inside the jacket also sends key information about the wearer’s physical condition to the rescue center, KT said. “We will cooperate with the Ministry of Oceans and Fisheries to distribute our jackets to local fishermen in the near future,” Oh said. Looking ahead, KT is planning to commercialize a specialized network designed for IoT as well — the Narrow-Band IoT that transmits data from devices to its existing LTE networks at low speeds and low power.